Attend an informational meeting at the school. Parents gain an understanding of the unique alternative that our choice of schooling offers. Parents can observe in the classroom and visit with the administrator about the school’s expectations of parental involvement in this educational model. One of the best times to visit is during our Learning Fairs at the end of each nine week period where the students showcase the projects they have worked on. Prayerfully consider your educational options. We encourage families to discuss every aspect of this exciting opportunity and to pray for discernment regarding whether Infinity Christian Academy, Inc. best meets your family’s educational needs. 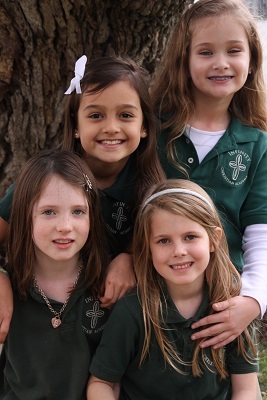 After careful consideration and prayer, if a family desires to proceed with the admissions process, an application must be completed for each student. Submit completed application and application fee. There is a $50 non-refundable fee to make your application “active”. Interview and placement testing. An interview will be scheduled with the parents to make certain that each family has had a personal opportunity to have all questions answered and to ensure that Infinity Christian Academy, Inc. is the appropriate school for your family.Placement testing/transcripts/report cards are required for admittance to Infinity. Confirmation of acceptance and enrollment. Confirmation of acceptance will be provided after a recommendation of grade level placement. The student will be enrolled upon receipt of the registration fee ($150) and the 1st month’s tuition ($285). Tuition is paid beginning June-March. All students are required to wear a school uniform while on campus. It is designed to encourage modesty and identify us as a unified group. Hunter green Polo shirt (short or long-sleeved) with the ICA logo. White, black or hunter green turtleneck/mock turtlenecks may be worn underneath Polo shirt on cold weather days. Hair must be kept groomed, clean and may not include bizarre coloring or styles. Boys’ hair may not extend below the top of the collar of the shirt. No hats or other head coverings, such as bandannas may be worn inside. Infinity Christian Academy, Inc. does not discriminate on the basis of race, color, national, or ethnic origin in the administration of any of its policies or programs. Admissions are contingent on space, abilities of the student, philosophy, and willingness of the family and student to participate within the school guidelines. Infinity’s model of schooling and calendar are uniquely fitted to make fun filled adventure trips a reality for our families. They will primarily consist of organized adventure events in the local area that are cost effective. In the past we have offered campouts for our families, field trips, river trips, bowling, Wilderness Trail, picnics, Majik Theater, Hondo Corn Maize, and Tower of the Americas along with many other activities. We have also emphasized the need for our students to be the “hands and feet of Jesus” by serving in the community. We collected hygiene bags the week after the Japanese Earthquake devastated the area and wrote sweet letters each month to the homebound elders of Leon Springs Presbyterian Church.